Both trips, Portugal ad Italy, where very good. I travel extensively and was very pleased with the service that your representatives gave everyone. Mary Dalton and Jarius were excellent. The hotels and restaurants were great. Thank you! I would go again this year on the trip they have planned but I have already booked two trips for the fall. Can’t be in two places at once! If I am available, I would certainly travel again with Collette! Already explained how I felt about my trips! Our tour almost made me wish I was born Italian!! Our Collette CA contact (Jarius) was so very knowledgeable about our destination and then the Italian tour guide (Savio) that we hooked up with was the icing on the cake. Both made this trip an experience to remember!! The pace of the tour, the quality of the guide and the hotel accommodations were top notch. Our bus driver was also multi-talented.....and I'll leave it at that as a surprise to the next tour. Sicily is an interesting country and we saw the best of it. We went to the higlights of Sicily, a trip I couldn't have planned better myself. We also went to a private farm and visited with a family. I loved that. The pacing was rigorous but balanced. The travel to and from on international flights could have been better arranged for the follks from Baltimore. Overall, the pricing, what we saw and travel on the tour bus was quite good. Quality tour guides who know the culture and daily life of their country. Also know history and food of their country. Staying across the sea from Sorrento and seeing Mt Vervisous from the shore. Excellent trip, itinerary, guide, fellow travelers, booking agent - everything was wonderful from beginning to end! Thank you! There were so many memorable experiences...Darion was awesome, the Greek Temples were amazing, the beautiful seaside villages or Taormina and others were a vacation spot we would come back to in the future, the winery was so much fun!, and Matera and Pompeii were so impressive historically...I really can't pick my favorite, as we loved the whole trip from beginning to end!! I have travelled with Collette quite a bit and they always go above and beyond to make our tour experiential. The optional tours were a great value. There were so many memorable moments but we especially enjoyed our visit to Matera where we met a local artist. This was my first time traveling with Collette. I thoroughly enjoyed the entire experience. The entire tour was memorable. We have traveled with Collette for seven trips. This was a very good trip. I do think that there was too much time spent traveling instead of visiting towns or cities. We basically spent two full days traveling; although our tour guide did stop along the way for some short town visits and some shopping. Unfortunately, we did have three days of heavy rain, but that certainly is NOT the fault of Collette or the tour guide. We made the best of it. The food was excellent and we truly enjoyed the little towns and local tour guides. We are planning another trip back to Italy in the future. Too many people on the tour. Thank you for traveling with Collette to Southern Italy & Sicily. Your feedback will be reviewed by the Product Development Team. Tour guide was fabulous, Mattia DiCarlo was very knowledgeable and quick to assess the personalities in the group. Beautiful tour of the Amalfi Coast. Well worth it! Our guide and driver were tremendous! All the stops and sight seeing were out of this world! Would do it again! Great memories! On the the beach at Naxos, Sicily. Hotel selection good but would prefer locations within city centers. Long day trip to vineyard for a 30 view of operation and dinner was very disappointing. Would have preferred Sorrento, Amalphi coast and Matera sequence. Palermo visit could have focused on major sites within walking distance of hotel versus bus trip to visit a cathedral. The visit to Matera was highlight of tour. This was our third trip with collette and each trip has been wonderful. Sicily and southern Italy was just beautiful! Our tour guide was excellent! Hotels were centrally located ! So manywinderful experiences that it is difficult to choose .. Cefalù , an optional tour was one of my favorite stops- the setting , the host and the food just outstanding! Hotel accomodations were excellent quality and very modern. Our guide was very informative and he handled every problem with utmost professionalism. The trip gave us a "glimpse" of many towns and cultures. There were so many memorable experiences - swimming in the Meditterean Sea, having sandals made in Amalfi, the views from Taorimina and Mt Etna. Efforts should be made to negotiate early openings for breakfasts. Good choice of hotels with one exception. The visits and the chance to eat at excellent sites was a real bonus. Eating at good restaurants especially the night where we had live music. The visit and meal at an agritourismo was a treat. It was a lot of fun and having the tour guide made it stress free. I was a little disappointed with Collette on this trip. We missed our connecting flight in Rome because our origin flight was delayed 1 1/2 hours. We only had 1 1/2 hours of connection time. When we did arrive in Palermo, it was upsetting to learn that our Collette rep had left. We found another one and really had to convince him to help up, which he finally did. The tour manager in Sicily and Italy was not what we are accustomed to with Collette. Pompei was probably my favorite. Thank you for traveling with Collette to southern Italy and Sicily. A member of the Guest Relations Team will follow up with you. The overall experience was very smooth and hassle free. The site selection and tour guides especially Jacquline in Palermo and Diane in Catania and Mt. Etna were great. Salvatore was an excellent driver and extremely pleasant and knowledgeable. Monica was super and made the whole trip unforgettable. The tour was well paced and we experienced all the places we wanted to see. The guide did an excellent job and was well versed in the areas we visited. Great tour, guides and hotels. We learned so much about So Italy that we didn't know and saw some wonderful sights. Thank you for the ride to and from the airport too. All of the details were so well organized for us from buses, hotels, route and sights. Great guides too. Exceptionally one of the best vacations!! What a wonderful experience we had on the Southern Italy 🇮🇹 & Sicilly tour. Everything from the tour itinerary to the staff and accommodations was a five star adventure!! We were treated to wonderful, delicious and authentic cuisine in every region that we visited throughout Italy. Collette was able to culturally immerse us in the various activities and tour explorations. Our tour guide Tony and driver Salvatore were exceptional to making the most out of our travel experience. Thank you to Captivating Journeys on Maui Hawaii for making this a effortless and flawless vacation. Ciao!! Exceptional experience in 🇮🇹 Italy!! Firstly I must say this tour should be a level 4 not 3 it was much more strenuous than my last years level 3 trip to Spain & Portugal was .I would have chosen a different vacation if I had known. In spite of that fact It was very well organized, went to interesting places & hotels were good.visits & dinners included were excellent. Our tour manager was excellent. I particularly enjoyed the visits to Aerobella.Do please continue to offer this part of the tour . In the Palermo hotel the pillows were like a couple of rocks ,the only place they were not excellent .Also please find a hotel in Palermo which doesn’t have a hike to get to the bus,first time ever with many holidays with different companies I have ever not had the bus at the hotel door. Thank you for your holiday offerings they are excellent,just need a couple of items attended to . Read what I have written today about activity levels to truly help customers judge which tour to go on. Thank you for traveling with Collette to southern Italy and Sicily. Your feedback has been forwarded to our Product Development Team. They will use your comments to enhance this tour for our future guests. The mini bus you put us on was terrible....knees touched seat in front, had to sit sideways with legs in aisle, every bump was exaggerated, a fine tour ruined with 1600 miles of discomfort....rest of tour was great, good director, guides meals, hotels etc. I could not take another Collette tour knowing the lack of concern shown for customer comfort...shameful! Thank you for traveling with Collette to Italy. A member of the Guest Relations Team will be reaching out to you to discuss your feedback. The tour met my expectations. I think you should have non- smoking groups. Some of our tour group were smokers and did not show much courtesy to others by not taking their smoking away from the group. When they returned to the bus, you cold smell the smoke on them. I thought the dinner meals at the hotels were not very good. Better to allow more free time so 43 people are not trying to be fed at once and can have better selection of what to eat. Thank you for traveling with Collette to southern Italy & Sicily. All feedback is influential in addition to being an important means through which we work to improve our product, service and customer satisfaction. We are grateful for your business and hope to see you again on another Collette tour. Collette is very organized and experienced. A well thought out tour at all locations. Very well planned and executed. Our tour guide Christina and driver were absolutely amazing. This certainly makes the trip relaxing and fun. Every need was thought out and delivered. It was all our favorite. Every stop had a great and memorable experience. Guide was mediocre at best. Did not take individual needs or questions . Avoided conflict. Amalfi Coast... we spent 1 hour and 45 minutes total there. Too many side trips to retail shops. Food at group dinners was very poor. Steak inedible!. Quality of food with group functions not good at all. Mattera, Taormina Small towns of Sorrento and Salerno--very authentic. Thank you for traveling with Collette to southern Italy & Sicily. A member of the Guest Relations Team will be reaching out to discuss your feedback. Liked the places we saw as well as th food and wine. Great trip, ***** the tour manager was outstanding! Even when the weather was not good she did a great job of making the day wonderful. Try Touring Off Season. It is a great experience. The January departure of Sicily and Southern Italy was an enjoyable tour. Zero crowds due to the off season, and a real feeling for what the average, not tourist, Italian citizen's life is like. Our tour guide, *****, was well versed in all the destinations, friendly and resourceful. Great tour, just the right length. Was surprised at the history and cross culture heritage of the region, and very much enjoyed the food and sights. Marta was excellent, she made every minute wonderful. Amalfi and Catania were highlights for us. The guide was excellent and most hotels were very good. 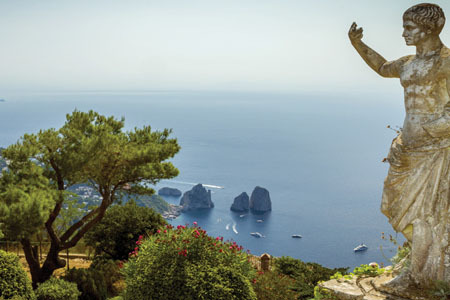 Don't miss Sicily and southern Italy tour! This is our third tour with Colette and we couldn't be happier with this company. Our guides have been exceptional and everything runs smoothly. The itinerary for this tour was great. Our guide ***** was exceptional. He's very knowledgeable, patient and organized. Our driver *******, always made us feel safe. The local guides and our side tours were great too. We had a wonderful group of people on this tour which added to the positive experience. This was our 3rd tour with Colette and we have been very happy with all three tours. We've had EXCELLENT guides and itineraries. Our latest trip was exceptional in every way. Every minute was terrific. Loved the itinerary. Great vacation - would tour with Collette again! Excellent tour manager and interesting and somewhat unique side tours. Accommodated my vegetarian requests extremely well. However, I did hear some complaints about the included meals from others in the group, so perhaps some research into improving those could be done. I thought the tour was managed very well. Good hotel choices, tours, tour guides, and bus driver. The tour manager was exceptional. He was always on top of all the coordination and the people. He had extensive knowledge of the country and lots of interesting stories. The local tour guides were very informative and interesring as well. The Amalfi Coast is a place I have wanted to photograph for over 28 years. It was worth the wait. Wonderful trip....can't wait to book another Collette tour!! First of all, the discount for being a loyal customer added to their booking discount and the free transport was so great. The tour guide and their pick of the local guides in Sicily were excellent. They were so knowledgeable and one of the even published books, which I purchased and am enjoying I have taken other tour s with different groups, but have found Collette to be better in terms of content, ease on the trip, exciting places to see, fun and most of all the best in terms of what you get for your money. The people on this tour were also a lot of fun and great people to be with for 10 days! I will always use Collette for other trips and highly recommend them to my friends! Thanks for making my trip so memorable and pleasant. The places we visited, the excursions offered, the guides, hotels and meals all made for a great experience. I felt the tour was well planned. I have specific food allergies and our tour guide was always careful that my needs were met. the pace was good, I choose to do all the extra tours so one of the days was very full, but rewarding. The driver got us everywhere safely. The city tour guides added a personal touch for us for the places that we visited. The hotels were in good locations. One did not have good WiFi but I indicated that on our survey, other than that it was fine. We visited cities and places that were rich in history - Matera, Pompeii. places - valley of the temples - saw natural wonders = Mt Etna and Mt Vesuviues. Seeing the cathedrals in Palermo and Monreale and Chefalu were very special to me. ;I cannot find just one place that was more memorable than the others. Perhaps the Amalfi Coast comes the closest. Recommend the tour for others with a few changes. Travel days are too long. Need some downtime before dinner. Too many local guides and the need for more tipping costs. Bus drivers were excellent. Collette guide was excellent. Hotel choices were great. Food was good. Vineyard visit was A1 as was the meal there. Checking in was smooth and timely at every hotel. Washroom breaks while travelling were not great. Not enough time to stand in a long bathroom line and make a purchase. Washroom choices could have been cleaner/more equipped for bus loads of tourists. History lessons were a little too detailed. Overall a great trip. The trip was well-arranged...all connections made, everything on time. The Tour Director was outstanding...well-organized and responsive and caring for the clients needs. Everything happened perfectly. The various destinations were outstanding. There are many things to do and see in Sicily and Southern Italy...this tour provided a good sampling of those things. We saw a whole lot of southern Italy. Our tour guide was very passionate about her country. Only negative is that the days were jam packed. Sometimes starting at 6 A.M. and ending at 10 P.M.. The days were too long for many of the seniors on the tour. Many people got sick. There was also A LOT of walking. Hello, thank you for sharing this feedback with us about the pace of the tour. We have passed this along to members of our team for review. \n\nWe appreciate you and value your insight as it helps us to improve our tours for future guests. We look forward to traveling with you again soon. Collette were a great tour company. Our Guide and drivers were very friendly and knowledgeable and provided a great tour. The accommodation was mostly very nice and the added excursions were lovely. The most favourable memory we visiting the family on the farm and dining in their restaurant and seeing the Sicilian way of life. The drive up the Amalfi Coast was also a treat. First ever tour with Collette and enjoyed it. Marco Our guide was excellent. Hotels good , meals good. Sometimes I think we spent too much time in some towns for lunch but I understand bus driver can only drive so far without a break. Loved the 2 and 3 day stays at same hotel gives you time to rest if you need it. 43 on bus but with 2 doors easy to get off and in plus seat rotation is good when everyone follows the rules. Loved the tour. Marco our guide excellent with full bus of 43. Made frequent toilet stops. Enjoyed 2 and 3 night stays. Travelers friendly. Sicily is a must to see as is Southern Italy. Hate the traffic and hustle and bustle if major towns, this tour is for you. Every town in Sicily I enjoyed, I am not a big city person and prefer smaller towns, hate the traffic but unavoidable on Amalfi Coast. Had choices in meals that were included, only one buffet dinner. Took an optional excursion to Savoca and enjoyed that. Told that the excursion to farm was excellent but unfortunately we didn't take it due to arriving late. 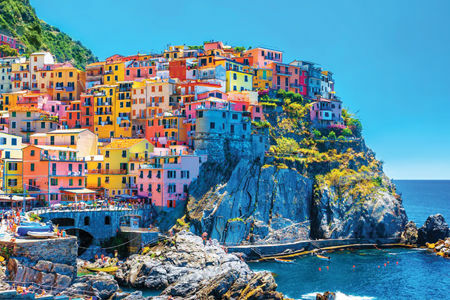 Always wanted to visit Southern Italy and viewing Truili houses there. Love Pompei been before and could go again. Our guide was terrific! She was full of energy and enthusiasm for her country. To improve the trip for seniors like us, more washroom breaks would be appreciated. The hotels were great, and the entertainment & sights. We enjoyed the music & dinner night. Would like to have more music. Outstanding!! Our guide ******was so informative and kind. That really makes the trip enjoyable. Hotels were fabulous and spotless. Local guides were also great. I didn't enjoy stopping at the jewelry store or woodworking shop. I would have liked to enjoy the town's more. Love Sicily, but mainland was great, too. Your representatives were always there when we asked a question or had a concern. Your brochures said "moderate" walking....I think it should have said a LOT of walking up hills, cobblestone pavement, etc. The tourguides walked way too fast for some of us to catch up to them & unfortunately we missed some of the comments, etc. Also, the last supper in Rome...why did we have to walk over 20 minutes to get there when there were other restaurants we passed that would have been just fine. Plus the restaurant was too small for our group. Dinner was adequate but we were crushed in that room. In fact, one couple had to sit in another room by themselves. The food in this establishment was sub-par compared to the rest of the places we ate at. Also, the only reason my wife and I went on this tour was because my wife always wanted to go to the Almalfi coast. Your brochure said explor the Almalfi coast. We only stop at a tourist little area for 10-15 minutes to get some pictures & soveneirs. Then we got on the bus and rode the rest of the way. Where is the "EXPLORE"". Plus we unfortunately has the driver's side of the bus. We DID NOT get to see the coast only the buses coming at us the the moutains. Why did I save so much money to explor the coast, and only get to see the road, busses, etc. VERY VERY DISAPPOINTED. Maybe the tour guide (half-way through our drive) could have asked the people to trade seats so EVERYONE could get a view of Almalfi coast, etc. My wife was very, very DISAPPOINTED. This was supposed to be her dream vacation.....NOT! Hello Archie, thank you for bringing this to our attention. We have forwarded your feedback to members of our product and tour management team for review. They'll use your insight about the tour elements to improve the experience for future guests. \n\nIf there's anything else you'd like to share with us, we'd be happy to set up a call with our guest relations team. Please let us know if you'd be interested in speaking with them. We appreciate your business and look forward to traveling with you again soon. Customer service was very accomodating whenever I called for info. The itinerary booklet was very helpful and informative. The limo service, Blue Bird Global was very professional and on time. However, I do have some issues with the tour which I will describe further into this survey. Too much walking due to bus not being able to park in a convient location when dropping us off to visit a site or going to dinner. Worse night was in Rome, we walked a good half hour to get to the restaurant when there were many restaurants much closer where we did not have to walk so far. The restaurant was very small and could not accommodate the group in the dining room and some people ate by themselves. The food was not up to par based on all the other wonderful meals we had. Very disappointed, we were not able to see the beautiful coastline of the Amalfi Coast due to the fact that we were sitting on the opposite side of the bus. 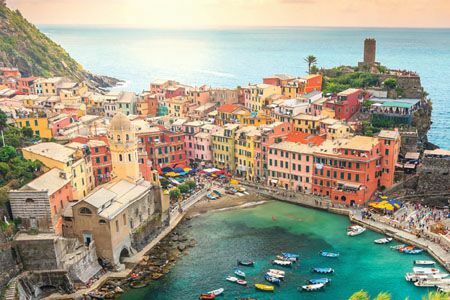 The tour manager should have switched the people over halfway on the Amalfi Coast so everyone would get a chance to see the beautiful scenery. Hello, thanks for bringing this to our attention. We have shared your feedback with our team and they will review it and use it to improve the tour for future guests. If you'd like to share more about your experience, we'd be happy to set you up with a call with our guest relations team. The tour to Salerno and Amafi Coast was very stressful. There were too many cities to visit in eleven days. We spent hours in the bus and a short time on the Amalfi Coast. 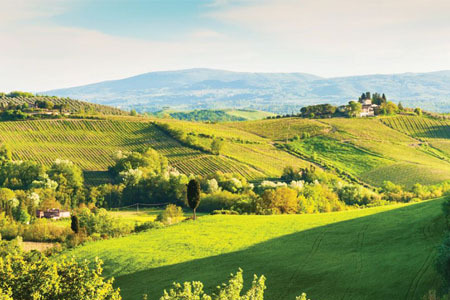 The winery tour, inlaid wood tour and Cameo factory should be optional. I,wanted time in Sorrento. I bought a ring at the Came Facory for over 900 Euro that was supposed to be sent to me. I have not heard from the Cameo Factory and not received my ring. The shop was supposed to be sponsored but Colette. The food at the hotels was awful. Hello Karen,\n\nThank you for bringing this to our attention. A member of our guest relations team will be reaching out to you to learn more about your experience. The favorite experience was the Amalfi Coast drive. At the beginning of our trip we were alerted by Delta that there was bad weather going into JFK airport and we could change our flight with any charges.. I call Collette and told them and they said they didn't have any weather warnings. So then I called the airlines and asked if l could change our flight and found out because it was purchased by Collette I could not. Make a long story short we missed our connecting flight had to sleep in the airport because no hotel rooms were available. It was horrible no. We did missed one meal and one day at the whole Day in Palermo . I was surprise that collected not get the Weather alert that I did for their customers. Our favorite moments were at the farms the food was excellent and it was nice seeing how the Italians live. We were disappointed at one of the farms because in your ad it said we get a tour of the farm and we did not. Hello Cynthia, we appreciate you bringing this to our attention. We have passed along your feedback about your experience with the flights and other accommodations on tour to members of our team for review. \n\nYour insight is valued and appreciated as it helps us to improve the tours for future guests. If there is anything else you wish to share about the tour, please feel free to reach out. We look forward to traveling with you again soon! I agree with my wife's comments. The people on the tour and the beautiful scenery. My husband and I were both pleased with the over-all experience of the tour we took with Collette. The accommodations were all clean and comfortable. We enjoyed all of the "included" meals and dining experiences. We were not impressed with our guide, however. Throughout the trip, she made many inaccurate generalizations and derogatory comments about the Italian people's habits and customs. My husband, being an Italian who was born and grew up in Italy, took offense to many of these comments. I, personally, think it is very inappropriate for anyone to make negative comments about others' way of life! There were many nice people on the tour that we enjoyed meeting. Sicily was beautiful and we thoroughly enjoyed the experiences each day. Hello, thank you for sharing this feedback with us about the tour manager. We have passed this along to members of our team for review. \n\nWe appreciate you and value your insight as it helps us to improve our tours for future guests. We look forward to traveling with you again soon. The tour leader was terrific - very knowledgeable about history and the areas. Enjoyed the two hotels on the Mediterranean. Other than Sicily, really enjoyed southern Italy. Well organized with lots to see. Especially liked the additional bus tour of Rome and the walkabout since Rome was not a scheduled visit. Tour Leader was excellent. Very knowledgeable about the history and the areas we visited. Loved Sicily and especially southern Italy. Though Rome was not a tour visit, we did do a bus tour and a walkabout to see several select sites. Terrific! I have booked 2 more trips with you and hope to see improvement. The itinerary, the tour guide, and the driver were excellent. Some of the hotels had issues and should be replaced, especially The Hellenia Yachting Hotel ( not certain if the name is exactly correct ). I did not care for some of the main dishes/choices on some of your included meals. You did not provide free water on the bus or in the hotel rooms. You asked the guests to tip the local guides and even the replacement driver on *personal info removed by Feef* mandatory day off. I did not. I loved the Sassi di Matera and Alberobella. Our tour manager, *personal details removed by Feefo*, and our driver *personal details removed by Feefo*, were excellent. . Our hotels were not as "comfortable" as expected. The tour guide at Pompeii was so bad we did not extend a gratuity in the end. Had we not toured Pompeii another time, with Collette, we would never have seen so much with an explanation. This tour guide didn't even let us take pictures. Taormina was just so nice. Spectacular views of Sciliy and So. Italy. Tour manager was excellent. She kept a large group (41) together, on time and happy, which wasn't easy. We had many different personalities, varying needs and opinions. But we were a cohesive group much to the credit of *Personal details removed by Feefo* Luggage transfers, bus drivers and tour guides made the transition from hotel to hotel seamless, plus the guides made the sites come to life with their knowledge of the area and history. 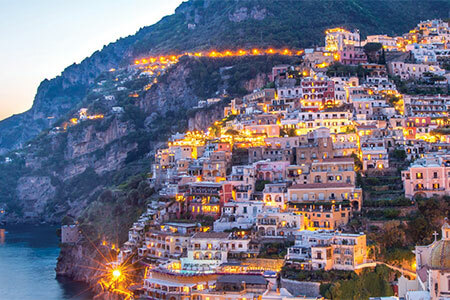 I enjoyed the mixture of historic Italian cities, the charm of the smaller towns and the beauty of Amalfi and Capri. Plus acres of farm land with orange, lemon, olives groves and grapevines. I would say the tour was just "okay." Wouldn't recommend it. Not really fond of the tour. The hotels were nice, but the some of the restaurants we were taken to were terrible, especially the one for lunch by the sea. That was the worst menu and everyone complained about the food and the price. I did not care for Palermo's portion of the tour. We enjoyed Mt. Etna and once we crossed over to Italy things improved a lot. At Mt. Etna there was nothing to do but wait until we were ready to board the bus again. It was boring because we were not dropped off anywhere near shopping so we just sat there. The food was better in Italy and the tour became more interesting. Our guide was great, just did not care for the first half of the tour. Not sure we will be doing a Collette Tour again. I loved the hotel on the Bay of Naples. We had a wonderful room and it was beautiful. The hotel in Rome was beautiful too, but we only stayed one night so couldn't really enjoy it. Loved the shopping in several places. I think my favorite though was Pompeii and the Amalfi Coast. Those were very interesting. Thanks for bringing this to our attention. We have shared your feedback about the first part of your trip with our team for review. They will use your insight to improve the tours for future guests. Overall we were very pleased with the holiday and the excellent services provided by (personal details removed by Feefo). We were also very impresses by our chuffer services from home and back. The hotels were very good and the attention to detail whilst in Sicily and Italy was again excellent. Our only complaint was the Airline (Vueling) which was very poor. The lost our bags for thee days out of ten days which almost ruined the holiday. On our way home we discovered that our baggage had not been paid for, a mistake you have acknowledged and repaid us for that! We would like to think that if we choose Collette again we would not encounter poor airline services. Are you able to re-assure us? I have already outlined my reasons. This was the best tour we have experienced and our first with Collette. Our leader was very knowledgeable about history and customs and had very good connections in each location we stopped at. Our hotels were all clean and well placed. We really liked that on the meals that were included with the trip we still had 3 choices. Our driver was excellent, he always was on time and in a prime location. There also was a great mix of scheduled time and free time. Based on this experience I would highly recommend Collette. I should mention that we were impressed from the beginning because of the customer service any time we called with questions! The city of Metera, had no idea it even existed. Great tour guide. Great itinerary. Did not deal with office direct....our travel agent did all. 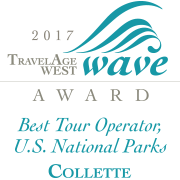 I have traveled on 7 (other companies) tours, but Collette was THE BEST!! The places we visited were wonderful. Our tour leader *Personal Details removed by Feefo*, was extremely knowledgeable. The information and history he gave us was exceptional! (I would love to travel with him again) The accommodations were wonderful and the planned meals were fantastic. The motor coach service and driver were great. The entire experience was wonderful, wonderful, wonderful! Personal interaction with a working family farm in Sicily. My husband and I own a farm in Virginia & naturally I was interested in this optional choice. Every day's planned schedule was so memorable that I can not choose just one experience. Thanks for bringing this to our attention. We have sent your feedback over to our product team to make sure the info is correct for future guests. We appreciate your business and hope to travel with you again soon. Good customer service, but flight arrangements didn't allow enough time in JFK for me to get my bag, go through custom, and reach my connecting flight. I had to leave my bag behind (it was sent through on a later flight), and RUN for my connecting flight two terminals away. Too much time on the bus going from Sicily to Catania, which I could have skipped altogether. To much emphasis on shopping instead of suggestions for other cultural sights during our free time. PACE OF ENTIRE TRIP WAS EXCELLENT. OLDER GROUP WAS GREATLY CONSIDERED. NICE BALANCE OF SIGHTS AND FREE TIME. SUPER GUIDE. Great trip, entertaining, informative, fun; good value. The guide was GREAT. The hotels had very poor WiFi, and should either have in-room coffee kettles or a 24 hour coffee/tea station readily available. This is important because due to jet lag, many of us wake up at very early hours, before the restaurant is open. Most hotels did not have simple exercise facilities, and even the few that did, had very limited operating hours, or equipment was out of order. a lot of favorable moments. the best is Alberobello. they make a great effort to show as many sites as possible in the time frame. amazing tour. the tour guide, Monica, was fantastic. Very professional and very informative. we had problems with suitcases not arriving when we did and she went beyond her duties to help get them. Our tour manager, Marco was wonderful, very knowledgeable and he always keep things moving. The local guides were great, very informative and interesting! The sites were beautiful. I enjoyed them even more when I got home and looked at my pictures. Our tour guide was fantastic. She was funny, informative and very accommodating. The places we went too and stayed at were well planned out and most interesting. Agrigento and Matera had great history to see and hear about. Taormino had beautiful gardens and vistas, while the Amalfi Coast was just spectacular. We had 3 dimentia travelers on the tour that we were always looking for. It took away from our trip. I realize that this isn't Collette's fault but it still affected our experience. The drive along the Amalfi coast was breathtaking. I enjoyed visiting the wineries. The ruins of Pompei were awesome! Climbing Mt Aetna volcano was great. Weather was freezing! The service staff answered all questions in a timely and helpful manner. They were helpful in planning our travel which was different than the tour itself. They allowed us to connect with the tour transfer from the airport to the hotel despite our having arrived four days earlier. We were, therefore, able to rent a car from the airport for personal touring and then return it to the airport, before joining the transfer. It made things so easy! Although we were delighted with the itinerary, we were disappointed in the superficial approach to seeing this history-rich island. The tour of Palermo was merely a drive through on the way to Monreale - which was a wonderful and focused visit. The Valley of the Temples showed us three temples but gave little exposure to why the community developed in the "Valley" or how extensive it was. The hotel here was exceedingly poor with littered grounds, failure of the water system, out in the boon-docks so there was nothing to do or see during free time. (Wish we could have visited Piazza Armerina since we traveled very near it on our way to Catania.) Materna and Alberobello were fascinating and a selling point for this itinerary. 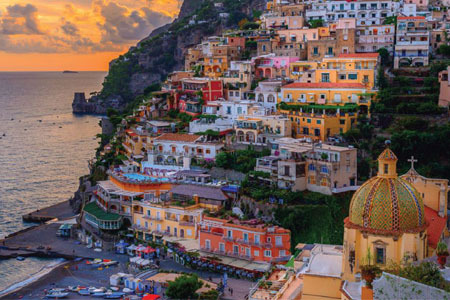 The Amalfi Coast spectacular. "Free time" gave us very little time to really look around a town - 1-1/2 hours is not much when we had to find our own lunch and look around, too. There was quite an emphasis on "shopping" which is not at all our emphasis. We would have preferred to visit museums that would have enhanced our understanding of Agrigento and Pompeii. The limoncello and cameo factory stops added nothing to the tour. The dinner tour to the family farm in Cefalu was superb! The dinner in Giardini Naxos with the musicians was a trial - the food and wine were not tasty and the musicians were so loud and constant that it made dinner conversation all but impossible. The Sorrento seaside hotel was lovely. We were amazed at the number of people on this tour - which definitely required a lot of walking on cobblestones - that were not able to walk very far or on hills. There were some travelers who frequently grumbling about having to get out of the bus "again". (Please note: a woman on a scooter NEVER caused any delay - she was marvelous!) The tour director always had good alternatives for these folks, but the comments got a little old. We came home thinking we had only skimmed the surface of Sicily. The local guides were all very interesting in their focused tours, and our tour guide was an efficient and fun tour director, but overall we felt the need to buy informational books along the way to fill in the holes that we felt remained in our exposure this magnificent island.